Pets are a part of the family too, which is why you shouldn’t leave them behind when you go on your family vacation. At Parkside Cabin Rentals, we offer a variety of comfortable cabins that range from 1 to 5 bedrooms and welcome your furry friend! To help you choose the perfect place to stay, we’ve made a list of 4 of our best pet friendly cabins in Gatlinburg for your family. Creekside is a cozy 2 bedroom cabin that sits along a stream and provides all the amenities your family needs for a great stay. With both bedrooms featuring a King-sized bed and a flat-screen TV, you won’t have to worry about fighting for a place to sleep or what program to watch on television. There is also a fully equipped kitchen where you can prepare family meals, a washer and dryer, a hot tub and more! Outside you’ll find a fire pit where you can gather around and make s’mores — don’t forget to share some graham crackers with your dog! You’ll also be less than 10 miles away from Gatlinburg and just minutes from downtown, so you won’t have far to go to enjoy everything the area has to offer. Bear Cove is great for large family vacations! With 3 bedrooms and 2 baths, you won’t have to worry about feeling too cramped or not having any place to sit. It’s located only .3 miles off the Parkway in Gatlinburg, so you will be just steps away from all the action. Take your pet for a stroll through the streets of downtown and take in all the sights! If you’re up for some family competition, you’ll love the game room, which includes a pool table and flat-screen TV. You can’t go wrong with a stay in this pet friendly cabin. For a family vacation filled with peace and quiet, stay in The Bunk House. This secluded cabin sits on 12 acres of land surrounded by dual creeks, which means your dog will have plenty of space outside to run around and play! There is even a walking path along the creek that is perfect for evening walks. With 3 bedrooms, a full kitchen, a washer and dryer, and a pool table, you will have everything you need and more for a fantastic vacation. There is even a large pavilion with an outdoor fire pit for you to enjoy! Small families will love our Smoky Cove cabin. 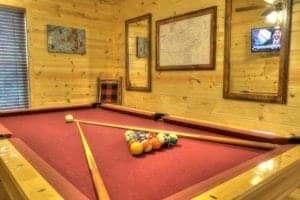 This pet friendly cabin in Gatlinburg is just a short distance from all the action downtown, meaning you will have no trouble exploring everything there is to do in the area. You will have all the necessities, like a fully equipped kitchen with a dishwasher, a washer and dryer, and internet access, as well as extra amenities like a hot tub, an outdoor wood-burning fireplace and a pool table. Also close by is the Gatlinburg Trail, one of the 2 trails in the Great Smoky Mountains National Park that allows dogs. You will love experiencing the beauty of the Smoky Mountains with your dog by your side! These are just some of the many incredible cabins we have that allow pets. Browse all of our pet friendly cabins in Gatlinburg and book the perfect one for your family.